​​Обновился TR-4597. 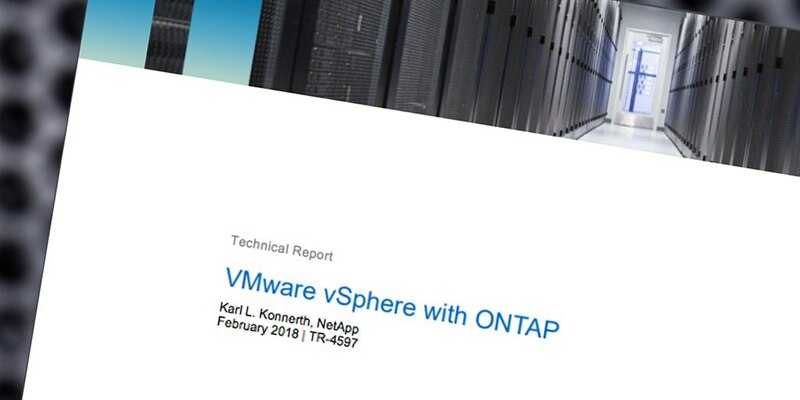 VMware vSphere with ONTAP. — Information about using the latest ONTAP features with vSphere, such as aggregate deduplication and automatic background deduplication. It also adds more detail on QoS capabilities, including using OnCommand System Manager for performance capacity-based provisioning along with adaptive QoS. — The latest on using Virtual Storage Console, VASA Provider and SnapCenter to provision, manage and protect your VMs, VVols and datastores. In addition to simpler deployment and configuration through a unified virtual appliance, VSC 7.1 also includes a new VASA dashboard that shows detailed performance and capacity information for VVol datastores and individual VMs. The Storage Replication Adapter for VMware SRM adds enhanced scalability and multi-tenancy support. — New or updated best practices based on feedback from customers and partners. These address Microsoft failover clustering, datastore sizing and LUN count, thin provisioning, the need for file system alignment, datastore migration as well as some other minor updates. — Additional information on ONTAP Cloud and how it might be used with VMware Cloud for AWS as part of your hybrid cloud approach. — Updated and simplified list of recommended host and ONTAP settings (Appendix B).